Update 4: In an update to its earlier post, Improbable describes its dispute with Unity as a "misunderstanding" while apologizing to "the incredible community of game developers we’ve seen engaging in discourse today." Without explicitly detailing where its negotiations with Unity stand, the post then suggests that today's confusion is an industry issue. "Ultimately a commercial dispute between two companies, in which both sides have certainly made errors, should never threaten access to essential technology used by a large number of developers," reads the update. Improbable then poses that the industry adopt "a code of conduct, or basic set of principles that the enablers within the ecosystem need to operate by." The post concludes by inviting Unity to join Improbable in its "broader thinking" effort. "You [Unity] are an incredibly important company and one bad day doesn’t take away from all you’ve given us. Let's fix this for our community, you know our number." Update 3: Unity co-founder and chief technical officer Joachim Ante has issued a response to Improbable's blog post, saying that it is "incorrect," and that live or in-development Unity-based games that use SpatialOS will not be affected by the actions it has taken against Improbable. "More than a year ago, we told Improbable in person that they were in violation of our Terms of Service or EULA. Six months ago, we informed Improbable about the violation in writing. Recent actions did not come as a surprise to Improbable; in fact, they’ve known about this for many months," Ante explained. "Two weeks ago we took the action of turning off Improbable’s Unity Editor license keys. This is a unique case—and not a situation we take lightly—but Improbable left us no choice. This was the only course of action to protect the integrity and value of our technology and Unity developers." Unity said that it told Improbable that games using SpatialOS would be unaffected by the deactivation, but that Improbable "misrepresented" the situation in its blog post. "We are genuinely disappointed that we have been unable to come to an agreement with Improbable, and their improper use continued until we took the action we did," Ante wrote. "Despite this fact, we can assure developers that they will be able to continue development while we resolve our dispute. We are committed to ensuring that developers will receive support for any outstanding questions or issues as we work through this problem." He also clarified the December update to its TOS, saying that it was made to address "ambiguous" language in the terms, and that the Streaming and Cloud Gaming Restrictions are essentially unchanged. The EULA will continue to cover standalone Unity-based servers, or those on cloud-based instances, but if a third party wants to run the Unity runtime in the cloud with their own SDK, "we consider this a platform," and that's apparently a problem. "In these cases, we require the service to be an approved Unity platform partner," Ante wrote. "These partnerships enable broad and robust platform support so developers can be successful. We enter into these partnerships all the time. This kind of partnership is what we have continuously worked towards with Improbable." Unity invited developers using SpatialOS to contact it directly to address any concerns. I've reached out to Improbable for more information and will update again if I receive a reply. 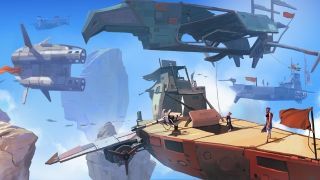 Update 2: Bossa Studios now says that, according to Unity, "Worlds Adrift should not be affected by the situation between Improbable and Unity." The Worlds Adrift servers will thus remain live for now. Bossa also says that "as far as it knows," Improbable and Unity are working together toward a solution. Update: "Lazarus is back up," developer Spilt Milk Studio said in an update on Twitter. The developer has also pledged to keep the servers running until they're forced down or told to turn them off. "We're not quite sure what's going on—we were told that access to the servers would be revoked by 2:30pm today but it seems that's not the case. Until either the servers are forced down or we’re told to turn them off, we’ll keep Lazarus live." Original story: A change to Unity’s terms of service late last year means that SpatialOS, a cloud platform used in MMOs, can no longer be used with the Unity engine, jeopardising any Unity games that rely on the platform. In-development sci-fi MMO Lazarus has already shut down its servers for the time being. “All existing SpatialOS games using Unity, including production games and in development games of all developers, are now in breach of Unity’s license terms,” SpatialOS developer Improbable said in an announcement today. Unity clarified the change yesterday, making it a breach of terms to operate or make games using SpatialOS in Unity. This won’t affect developers using SpatialOS in other engines, such as UE4 and the CryEngine, and Improbable says it’s currently working with other engine creators to see if games affected could transition to an alternative engine. Improbable still believes that a “swift resolution” is possible and lists steps that it plans to take, including helping developers using SpatialOS with Unity to “finish, release and operate their games”. An emergency fund is also being set up to assist developers who will be left in financial difficulty. Improbable was not informed about the termination of its licenses, a representative told me, and Unity hasn't informed Improbable about its customer support plans for the developers affected. I've reached out to Unity to get more details.